Derworiz took questions from the audience about climate change and how the Canadian government is addressing the issue. Photo by Alyssa Rabil. Over the course of Colette Derworiz’s 17 years at the Calgary Herald, she’s reported on everything from breaking news to enduring social issues, yet her latest beat has taken her out of the city and into the national parks. Now as a senior reporter on environmental issues, Derworiz spoke to the UM School of Journalism about Canada’s changing climate. 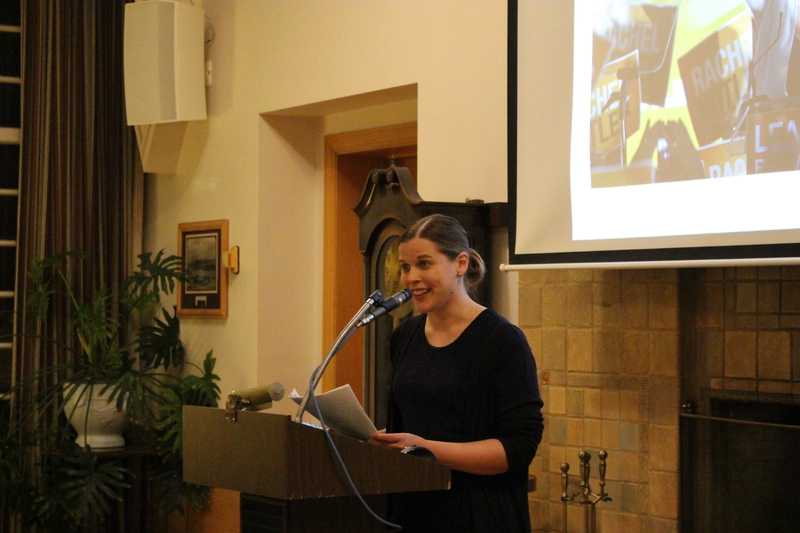 Her talk reflected more than just the environment, but also the recent changes in Canada’s political and economic climate. After Prime Minister Justin Trudeau’s election in October 2015, he removed the so-called muzzle on Canadian scientists that previously banned them from speaking about climate change issues and research. Within these last few months, Derworiz said that climate change went from not being considered a dirty word to becoming a major focus for Canada’s government. Associate Professor Nadia White asked Derworiz if scientists had opened their communication with the public since gaining the freedom to talk about climate change. Legally, Derworiz said the government has clearly communicated this new right, but that researchers’ attitudes have yet to change. Derworiz spoke at the J-school as part of the Marjorie Nichols Lecture series. Nichols graduated from the J-school in 1966 and worked as a journalist in Canada. In 1998, UM awarded Nichols the Distinguished alumni award, and she continued working in the field until her death from cancer in 1991. Nichols was known for her national political commentary, but as an environmental reporter Derworiz has also seen how the political arena can impact natural resources and the policies governing their use. Alberta’s economy, like Montana, relies predominantly on extraction-based industries and is known for the Athabasca oil sands in the northeast part of the province. Starting in 2017, Derworiz said the government’s goal for the nation-wide carbon tax is to help fund cleaner ways to use oil and coal. However, Derworiz knows that environmental issues extend beyond the border. Recently she reported on the trans-boundary sage grouse population between Montana and Alberta and a new plan to relocate 40 sage grouse to Alberta, with hopes keeping a more even distribution on both sides of the Canadian border. Of current interest to Derworiz, are the upcoming talks between Prime Minister Trudeau and President Obama on March 10th. The uncertain future of both countries economies and elections means that Derworiz won’t be running out of stories to cover anytime soon.